Alchemy seems to be in fashion. This is the third book in about as many weeks that I have read with alchemy taking a prominent place in the story. Alexander Potter was a Civil War doctor who has gone above and beyond the normal atrocities that doctors were noted for during the Civil War (that primarily being a great deal of amputations). Now Potter travels with a freak-show/circus where he hawks his snake-oil cure-all. Most of the tonic is useless but there is a tonic that will bring the strongest men to their knees – or something much worse. But Potter is not the villain here. Potter is a pawn to the much more villainous circus manager, who in turn is a pawn to someone further behind the scenes back on the coast. They travel through backwoods towns relieving rubes of their money and bringing about a little horror. Early in the book, as the character of Dr Potter was being established, I was really captivated and interested. I could hardly wait to get in to his story. Then we got to know a few more characters. And the story? Well, it was sort of being told to us along the way but we weren’t really being drawn in to experience the story ourselves. But it was close … oh, so close. My biggest issue with the book was the characters. Potter is our central character, but no one, including Potter, was particularly likable. If you’re going to have a story with a bunch of despicable, or at least unlikable, characters, then you need a story that is really strong and this one just didn’t have it. Though I didn’t really expect a horror novel from Angry Robot, that is what we get here and I’ve said it before – it’s really hard to write a horror novel. Being able to sustain the suspense and keep the reader on edge is something few people can do well (and why those who can do it well manage to stay at the top). There’s some promise here, but giving us somebody to root for would have helped. Looking for a good book? 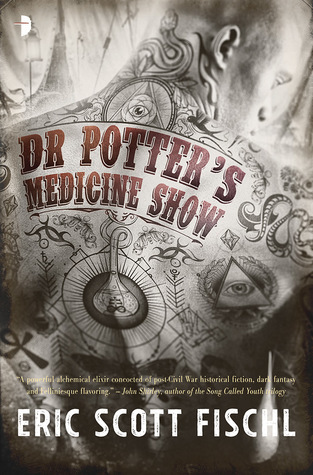 Dr. Potter’s Medicine Show by Eric Scott Fischl is a promising Civil War-era horror novel but doesn’t quite rise up to give us engaging characters or a very strong story.